Even if all remains quiet for now, one of the Catholic imagination's more unique rituals continues as this Friday dawns in Rome. 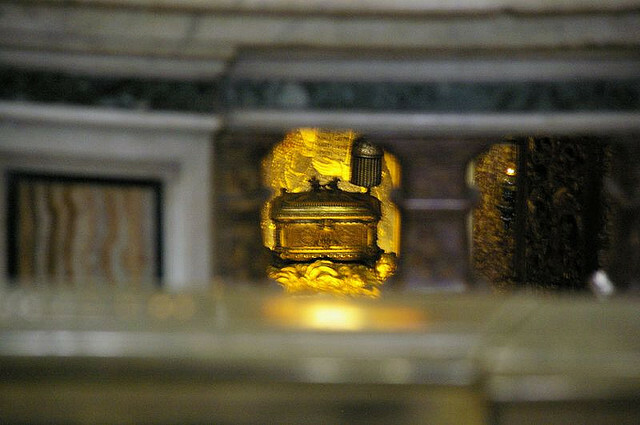 Every year on the vigil of Saints Peter and Paul, the year's freshly-woven batch of the pallium -- the symbol worn by metropolitan archbishops within their provinces to signify "the fullness of the episcopal office" -- are placed in the gilt casket shown above, to spend this night in the tomb of the First Apostle. From there, come morning, the Pope will confer the lambswool bands of ancient origin on 43 prelates named to archdioceses across the globe over the last year, giving it as "a bond of love, and an incentive to courage." While newly-named metropolitans have made the trek to the Vatican to receive their pallia from the pontiff since 1984, this year's rite -- beginning at 9am Rome time (3am Eastern; livestream... and worship aid) -- will be unique in two aspects. 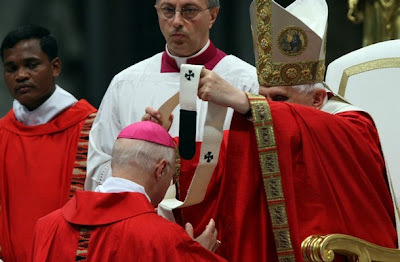 For starters, a new change to the ceremonial has moved the distribution of the garment to before the Mass, as opposed to its prior place following the homily. And in a gesture that's both an ecumenical landmark and a treat for a music-loving Pope on the 61st anniversary of his ordination to the priesthood, the choir of London's Westminster Abbey -- which blew the Vatican delegation away during Benedict's State Visit to the UK in September 2010 -- will join the usual Sistine Singers to sing at the liturgy. As this year's recipients go, the 44 archbishops include two prelates already made cardinals -- the youngest member of the Papal "Senate," Berlin's Rainer Maria Woelki, and the Mexican Francisco Robles Ortega, who gets his second pallium after his transfer from Monterey to Guadalajara, the country's second-largest diocese, last year. Other high-profile figures among the global group include the new patriarch of Venice Francesco Moraglia, Archbishops Chito Tagle of Manila, Christian Lepine of Montreal, Andrew Yeom of Seoul, Mark Coleridge of Brisbane, and Paul-Andre Durocher of Gatineau, the vice-president of the Canadian bishops. Per usual, the world's largest Catholic country -- Brazil -- leads the pack with seven new metropolitans in tomorrow's class. The US delegation, meanwhile, is led by the figure who's taken on American Catholicism's most daunting episcopal assignment in the last half-century (and the recently-named host of the church's 2015 World Meeting of Families), Philadelphia's Archbishop Charles Chaput OFM Cap. -- receiving his second pallium 15 years after his first, for Denver -- joined by his successor in the Rockies, the native son Samuel Aquila, who'll be installed on 18 July; the "quarterback" of the USCCB's religious freedom push, William Lori of Baltimore; and, in a rarity for an Eastern metropolitan, William Skurla, the Ruthenian archeparch of Pittsburgh. The Peter and Paul Mass traditionally marks the end of the Vatican's working year; much like his Curia, the Pope is scheduled to leave Rome next week until late September, in his case to spend the summer hiatus at the papal villa at Castel Gandolfo.